Kaki (Japanese Persimmon) is in season now! Some of my viewers requested me for a simple sweet using Kaki, so I made this for you. I hope you like it. It was really good!!! BTW, if you use Tofu instead of water, Dango become much softer. 1. Put Shiratamako, sugar and water in a bowl and knead the dough with your hand until smooth. Adjust the texture by adding more Shiratamako or water until the dough turns as soft as your earlobe. 2. Divide the dough into 8 small pieces and roll into small balls. Then press the center of the ball gently with your finger (in this way, dango cook evenly and faster). 3. Bring a large pot of water to a boil. Gently drop the Dango in the boiling water. After a few minutes, Dango will float to the surface. Boil for another 1-2 minutes. Then remove from the boiling water and transfer into cold water (to cool and remove the slimy texture). After a minute, drain well. Make the same as the white Dango, but sift the Matcha green tea powder before mixing. 1. Cut Kaki into bite-size pieces. 2. 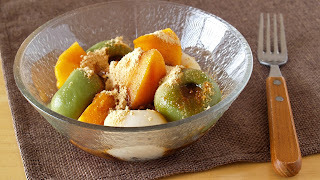 Place the Kaki and Dango in a dish. Top with Kinako and Kuromitsu. *You can store the Dango in the freezer. When you eat, defrost at room temperature OR microwave OR cook in boiling water. *You can store the Dango in the fridge for 3 hours but they can easily get hard, so I don't recommend it.